One of the entertaining aspects of fitness is the fact that there are lots of things we can do to keep us motivated and targeted to meet our goals. Over the course of three months, I’ve gotten into walking for long distances, using various resistance devices (bullworker, etc. ), doing yoga, lifting weights, etc. A couple of months ago, I added something to my training that I hadn’t used in years, but made a lot of sense to put back into play. In short, I broke out my old PlayStation 2 and several volumes of Dance Dance Revolution (DDR) to help get me back into “fighting shape”. This experience reminded me of a testing situation that I got to deal with about 12 years ago when I worked at Konami Digital Entertainment, and how it influenced my purchasing decisions back then. By virtue of working for Konami, and having made friends with several of the people in marketing and distribution, I was able to get a number of the DDR games for free. To that end, I picked up Dance Dance Revolution Konamix (a PS1 game but playable on PS2), DDRMAX, DDRMAX2, and Dance Dance Revolution Extreme (these later three released for PS2, the latter two in development while I was at Konami). The games themselves had their quirks, as do they all. It’s funny to look back today and see a variety of misspellings, or menu options that don’t flow quite right, but that went to production nonetheless, back in an age when a bug, if released, was eternal. Still the games themselves were, and are, still fun, and the music especially brings back a lot of nostalgia. The issue that became a big deal was not with the games themselves, but with the dance pads that were made for Konami. These dance pads had a fairly high number of pads that had an odd sensor issue. Over repeated use, if you were to step on the back arrow while stepping on another pad (common for jump steps and just making movement more efficient), the sensor would either intermittently not work, or it would just stop working entirely. This was not an isolated issue, it turned into a big deal heading into the new year in 2004. In fact, I had been “seasonally laid off”, after the Christmas rush of 2003 was over (which was, truthfully, expected, and since I was back in school at the time, I didn’t necessarily despair at such news). The problem with the number of pads was large enough that I was actually called and asked if I’d be willing to come back in to help them deal with the issue. I said “of course” and subsequently was rehired and worked with Konami all the way through the remainder of my time back in school. The dance pad issue was a manufacturing defect, and it would be a significant portion of my side customer support work for the remainder of my time there. Because of this, when I decided to pick up these DDR games for my kids to play with, I was happy to have the games, but I opted to buy different, non-Konami dance pads. There were ranges of designs from foldable soft pads that cost about $30, to hard metal and plastic pads similar to what the DDR machines in arcades had, and these cost around $250 each. Through my research, i discovered a set of pads in between made by RedOctane. These pads used rubber mats internally to make the pads semi rigid, but light enough to be moved easily and stored (in this case, behind the couch in our upstairs family room). During the course of a couple of years, the various games were played by my kids, and myself as well, but then, like many things, the pads were tucked behind the couch and sat there for years. the games were tucked away into the PlayStation 2 games drawer, kept for a later date and time (I believe in the replayability of games, so I tend to hold onto titles for years, because I enjoy revisiting older titles to play them again after a long absence). 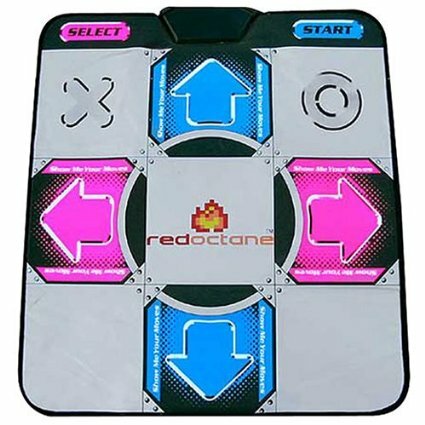 In November of 2015, DDR and the RedOctane pads made their emergence from behind the couch and from within the storage bins, and returned to center stage in my reality. DDR has a workout mode on each of the games. What’s nice about the workout mode is that you can set a number of parameters. By entering in your weight, preferred step settings, and calorie targets, you can customized a workout that can be as short or long as you need to meet your goal. I’ve experimented with a variety of the settings, with the goal of hitting 1000 calories. Averaged out, it turns out that 1000 calories is about an hour and forty minutes of “dancing”, which really is more stepping on arrows in time. Another benefit of workout mode is that you can turn off the “typical game behavior of “failing when you don’t hit the steps well. It’s a great feature for game play, but a lousy feature when you want to keep going regardless of steps and score (and believe me, after close to ten years, my step accuracy at standard mode and higher leaves a lot to be desired 😉 ). Another nice benefit of having this as a workout option is that it allows me to combine workout goals and step goals. Instead of trying to walk 10,000 steps, on certain days I can “dance” those steps, or at least a fair number of them. this does tend to make calorie counting and averaging a little challenging, but I’m not stressing over it too much. If I’m able to burn 1,000 calories by playing, that’s plenty for just about any given day. As of this morning, I am holding at 214.8 pounds, or just over 45 pounds down from 260 when I started this whole thing August 14, 2015. Variety is the spice of life, and today, I am thankful for an old amusement for coming to the rescue and offering me a bit more variety to add to my activity mix. Though I can’t guarantee 1,000 calorie burns every day, every little bit helps, so here’s to keeping on :).